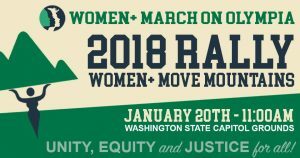 Action 1: Save the date, January 20, 2018, Saturday and RSVP to attend the Olympia Women’s March. We DEMAND Unity, Equity and Justice for ALL! We believe that Women+ Rights are Human Rights and Human Rights are Women+ Rights. We demand a society in which women – including Black women, Native women, poor women, immigrant women, disabled women, Muslim women, lesbian queer and trans women – are free and able to care for and nurture their families, however they are formed, in safe and healthy environments free from structural impediments.